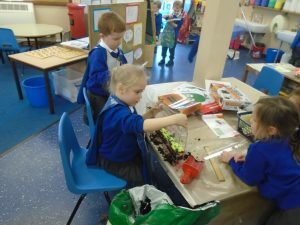 A couple of weeks ago we noticed that there were a lot more worms in the garden. 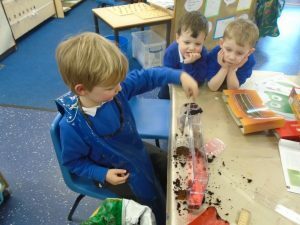 We decided to find out more about worms and learnt that they are really important to help things grow because of the tunnels they make. When they make tunnels, the rain water gets deeper into the soil and to the roots of trees and plants to help them grow. They are also good at eating dead leaves and plants. We found out that they have no eyes, ears or bones but they do have strong muscles which help them to move. They can also feel vibrations in the ground so can hide away when they feel something coming. We decided to make our own wormery. 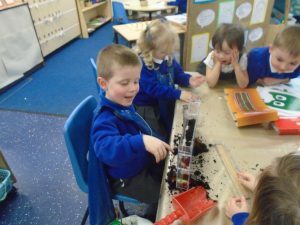 We used compost in a box and layers of coloured sand so we can see the tunnels being made. We put some dead leaves on the top so they have food and made sure that the compost was damp as worms need to have damp skin so they can breathe. We then put a cover over the top because worms prefer the dark as they avoid the sun in case it dries their skin out. 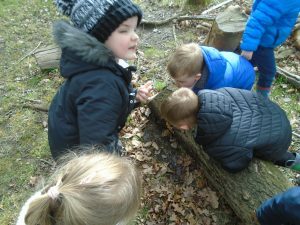 We went on a worm hunt around the forest school. We found that the place to find the worms was under the logs where it is dark and damp. We have lost count of how many we found as we continued to collect them all week! 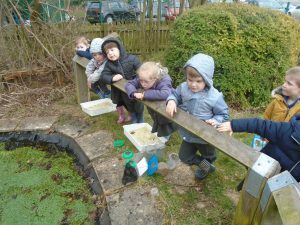 Whilst looking for worms, we also checked the pond for frog spawn. There was lots! We collected some and brought it back to Nursery. The eggs are already turning into tadpoles. 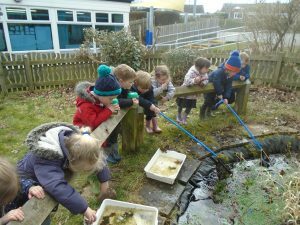 We have been looking at the life cycle of a frog and are hoping our tadpoles will turn into froglets and then frogs! 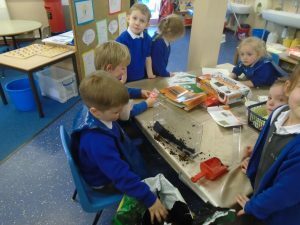 The Nursery children have really enjoyed learning about worms and making their wormery. 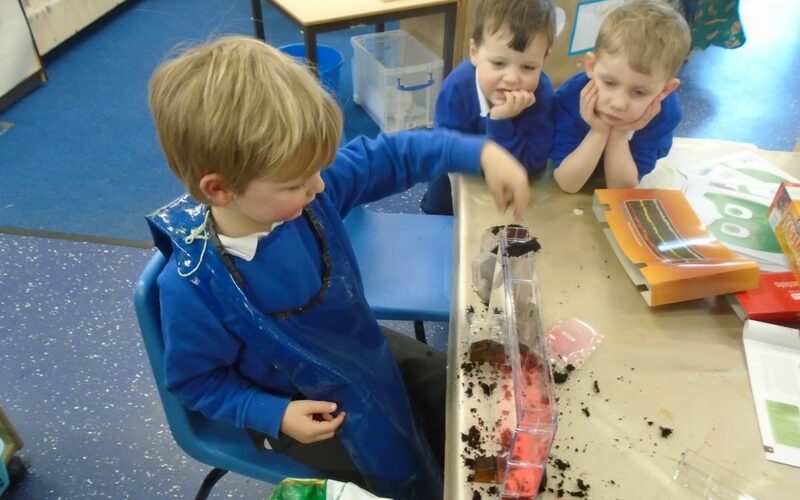 The boys are very keen to find new worms to put in it. 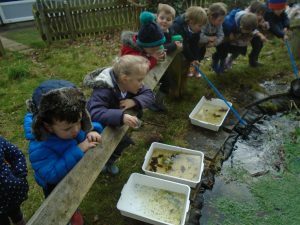 It has been very interesting looking at the tadpoles as well. Seeing them turn from eggs into tadpoles. Look forward to seeing them start to turn into froglets. We will have to watch out for frogs hopping around in the little yard!!! 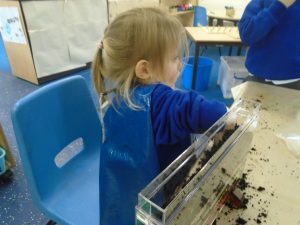 Thank you for showing me the wormery in Nursery, children. I too hope your tadpoles grow up to be froglets then frogs and that they will stay with us in our pond!